K10 are a London wide construction skills network, training apprentices and deploying them where and when they’re needed. Syma was one of the first K10 apprentices, and to this day continues to be an ambassador and friend. She had always harbored a passion for DIY and plumbing since childhood, but did not think a career in the trade was viable and spent 15 years working in retail. Syma’s enthusiasm and zest for life proved to surge into her work and college life. Hosted by Breyer Group for the three year duration of her apprenticeship they have subsequently employed her directly. 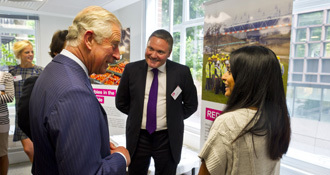 Syma has represented K10 on a number of occasions and has enjoyed the privilege of meeting HRH Prince of Wales and HRH The Duke of York.